Those of us with DINOS™ definitely want our space, but that doesn’t mean we never want our dogs to enjoy the company of other dogs. 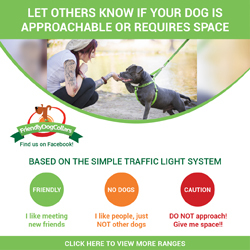 We simply want or need more structured socialization opportunities where we can count on other dog owners to respect our space. 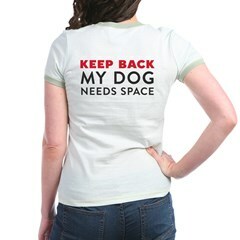 This is especially true for reactive dogs who are learning to stay calm around other dogs. If you’ve ever been in a reactive dog training class, you know that one of the best ways to increase your dog’s skills around other dogs is to practice, practice, practice. But that can be really hard to do once class is over and you no longer have a set time and place to meet up with other responsible families who are working on their dog’s leash skills. That’s where dog walking social groups can really come in handy. If you have a reactive dog and you’ve laid down the foundation for your leash work in a group class, a great way to continue working on your skills and exposing your dogs to other canine pals, is to join a dog walking group. These groups are a terrific opportunity for any dog, reactive or not, to socialize with canine pals. Contrary to popular beliefs, off leash play isn’t the only game in town when it comes to socialization. Side by side walks on leash and training classes are social activities for your dog too! So whether you have a dog that is a social butterfly, but prefers calmer, on-leash socializing (like a senior dog) or a dog who needs exercise in a more controlled environment than a dog park (like a dog recovering from an injury), groups walks might be the perfect fit for you. Know your dog and their limitations. These groups aren’t every dog’s cup of kibble. Know the rules of the club. Every group is different. Many of dog walking groups listed here follow the rule that dogs do NOT interact during the hikes or walks and openly encourage DINOS to attend their events. But please check first. Some groups allow more interactions between dogs and might not be the right fit for your pup. You’ll also need to know if your dog is up for the challenge of being around a potentially large group of dogs. You may need to start small and work up to joining this type of social outing. If you’re looking for a dog walking group to join, take a peek at the listed below. Note that many of the groups listed are pit bull groups, but don’t let that stop you from signing up! The overwhelming majority of them welcome all dog breeds to join in the fun and benefit from the structured group walk dynamic. 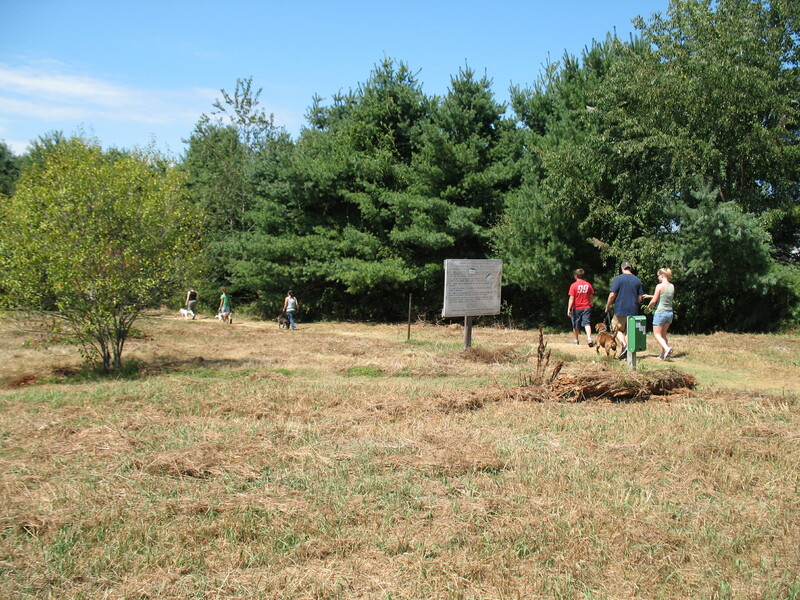 Founded as way to socialize and exercise their pooches, these groups serve the dual purpose of educating the public about these misunderstood dogs. Pit bull peeps rock my world. Just sayin. And if you know of a group not mentioned here, please let me know in the comments below, so I can add them in! Take a look at some of the blog posts, listed below, for helpful tips and photos. It’s also worth visiting each one of the groups listed above, because almost all of them detail their rules right on their homepage. Each group is a little different, but you’ll see a lot of overlapping ideas and guidelines to incorporate in your new group. Dogs don’t interact with each other. Flat, standard issue leashes required. No flexis. Dogs with reactivity, aggression, or in some cases, new dogs, wear red bandanas, so that the group members know to give those dogs extra space. There are two people present without dogs. One at the front of the group and the other at the back. They are able to support the dog walking pairs with training, watch out for loose dogs, and provide an extra set of hands (personally, I’ve held a lot of dog leashes while people tie their shoes!). The two group leaders use walkie talkies to communicate, if the group is large and spread out (like on a hike). The group leaders carry tools such as Direct Stop, for safety. In densely populated areas, the number of dogs is limited and must sign up in advance. Groups use Meetup.com or Facebook pages as a way for member to communicate with each other about upcoming events. And may I suggest handing these pocket sized educational cards out to people you pass? If you’re looking for people to join your new group, I highly recommend contacting a trainer to see if they have clients that might benefit from this kind of outing. Even better, join or contact a dog reactivity class and then, after the course is over, have the group continue meeting. They’ll have similar skills, an understanding of each other’s needs, and a motivation to keep on coming, so they can practice. Feel free to post about your new group on the DINOS Facebook page too. How many of you belong to a group or are planning on starting one? Let me know in the comments and on Facebook! SIDE NOTE: I’ve heard from a few of you who would like permission to use “DINOS” in your new dog walking group’s name. I think that’s super cool! 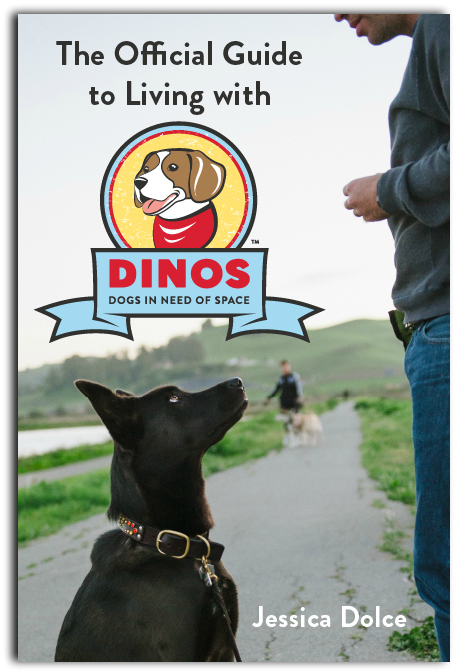 You’re welcome to use “DINOS” and/or “Dogs in Need of Space” in your tag line or description section of your group’s website, so the public knows that DINOS are welcome. DINOS is trademarked (which means it cannot be used for commercial purposes), so using it this way, instead of in your group’s name, would allow you to create a group logo or merchandise without any issues. If you have any questions, please contact me directly at: info@notesfromadogwalker.com for more information. Thanks! I sure will – thanks Kerry! I was getting ready to ask that you add my group, Pit Bull Zen, but it’s already on there! Thank you so much! Many of us have reactive dogs (myself included) and it’s lovely watching the dogs move into a natural pattern, with appropriate spacing. Everybody knows who can walk next to who, and the occasional snark doesn’t bother anybody. Group walks are amazing. You have a fan on Facebook (Monica C.) that let me know I missed your group, so I just added it! I’m a huge fan of group walks – thanks for offering them to families in your area. oops – I reversed it! Will fix now…thanks! Corpus Christi* no e 🙂 thanks for the fix! Thank you for including KC Pittie Pack in this list! We strive to provide a positive, non-judgmental environment for all kinds of dogs and their people. We have several DINOS as well as overly social dogs. It’s exciting when we can see improvement from the beginning of a walk to the end. The dogs of KC are lucky to have you guys! Yes! Like Crystal said, thank you for including the KC Pittie Pack in your list – we feel honored to be amongst such a great list of groups! Thanks so much for pulling this all together and including Chicago SociaBulls! We have many DINOs on our walk and it’s amazing seeing how much they progress within this structure. It has been so valuable to many members. Thank you for being such a great resource! Does anyone know of any groups in the Reno/Sparks, NV area? I have an AmStaff who doesn’t need space, but does need some help not being so excited around other dogs. People up here are terrified of Bully Breeds and I’m having a heck of a time finding a group to walk with! I couldn’t find anything, but I wonder if there is a trainer or leash manners class that might be helpful/interested in your area? If there is anyone in or near Pasadena, CA that would be interested in either starting a group, or know of a group, I would be interested!!! I can’t believe in a area as large as Los Angeles and with as many pit bulls as we have here, there are no groups! I was thinking of just “going for it” and starting up a group, but am a little intimidated. Thanks for mentioning us! This is so important and helpful! Thanks for all you guys do for the DINOS of NYC! You deal with a lot of challenges in that environment – the dogs are lucky to have you guys on their side! Sonoma County Residents Responsible About Pit Bulls, or as we call ourselves, SCRRAP. Thanks Rebecca – I’ll add you guys to the list! Thanks Amanda – I’ll add your group to the list too! I should have wrtietn this long ago. Randy took a vicious, fear filled dog who had undoubtedly been abused, and taught us patience. This dog, Simpson, a Black Mouth Curr, known for aggression, was rescued at about 3 months. After finding homes and having him returned, we decided to keep him. I cannot tell you how mean and territorial he was. To the point of attacking us if we came too close. My husband insisted that he had potential. But it was so clear, this dog was too vicious to be a pet. Then we called Randy. Randy explained fear aggression’. He taught us to work with Simpson not against him. And each night as this 85 lb puppy’ curls up against me, I am thankful that I listened to my husband who had faith in Simpson’s potential. But more so, I am so grateful for Randy. What made me call his number? I don’t know. But I’m glad I did. Simpson is well behaved, smart, loving and loyal. A bit excited when friends come over and maybe a little protective. But he is home. Where he belongs. Thanks to Wipe Your Paws and Randy. I would LOVE to find a group in Anne Arundel County Maryland. Our new pup could definitely benefit from a group like this! What a great idea to pull all of this info together! Thanks for the mention… many of our new members first saw us here! That’s awesome – glad they found you! We are just starting a group in the Phoenix metro area in Arizona. We’ve been in the planning stages but are just about to start our first hike with lots of advice from Two-pitties/Chicago SociaBulls. Our group is called Explorabull. (http://explorabull.wordpress.com/ and http://www.facebook.com/ExploraBull) We’d love to have some new members! I’ll add it now! Good luck with your new group! Social Walks der Hundephilosophin, http://www.diehundephilosophin.de/Spaziergange.html. Thanks for reading and letting me know about your walks. I’ll add them to the list! Could you please add, Lucas County Pit Crew in Toledo, OH? We have many Pit Crew Group Walks! Will do – thanks for all your hard work in OH! 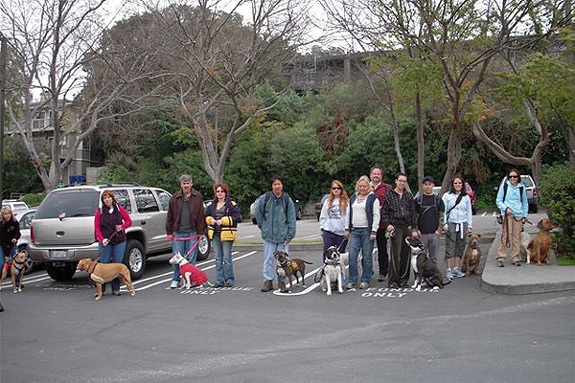 Please add Pit Bulls Pounding the Pavement, we were the original founders of pit bulls walking in groups in 2007 . We Pound the Pavement to Promote Responsible Ownership and Promote Positive Breed Image. Thanks Crystal! Are all breeds welcome? And is it ok if reactive dogs in training join or is this for well socialized, calm dogs only? Just want to make sure! Perfect page thanks a lot for building it up. I am just starting Pack Walk activities in our community and I really liked the rules you set up here. Thanks again. We have a dog adventure walking group in Charlotte NC and it’s called HOWLING HIKERS. Come find us on Facebook. We meet up in the NC mountains and greenways for some fun and exercise! Are DINOS welcome in your group? Yes, I own a DINO! We’re starting a dog waking group in Erie, Pa called PEDs (Pack of Erie Dogs). Our first walk is May 5th, 2013. All breeds and issues welcome! I’ve started a dog walking group called The Dog Pack in Austin, TX. https://www.facebook.com/groups/619848404706515/ Thanks for sharing! I have been hosting a Bully Breed Walk every Saturday for the last 3 years in Massachusetts. If you live in New England, please feel free to join our group. Walking isn’t the only fun thing we do! Come check us out, were a great group of almost Two Thousand local Bully Owners that are making Positive Pitty things happen every day! Here’s a link to the group! And a link to the walks! My meetup group is PUREHEART PITBULL LOVERS. We meet once a month, have over 70 members! !